With Zoho Projects Dropbox Integration, you can now share files that matters the most from your Dropbox account into Zoho Projects documents area and vice versa to simplify your work and ramp up your productivity. Dropbox integration is available only in Premium and Enterprise (Monthly and Yearly) paid plans. Select the required project in Projects and click the Documents tab. Click Dropbox and then click Configure your Dropbox sync. Click Configure New Dropbox Account in the Configure Dropbox Account tab to create your dropbox account. Click Add New Sync if you've already configured more than one dropbox account. Now, select the dropbox account to integrate into Zoho Projects. Select the Dropbox Folder in Select Folders and then in Zoho Docs Folder choose the folder to associate the dropbox account. Click Start Sync in Start Sync to initiate the synchronization. 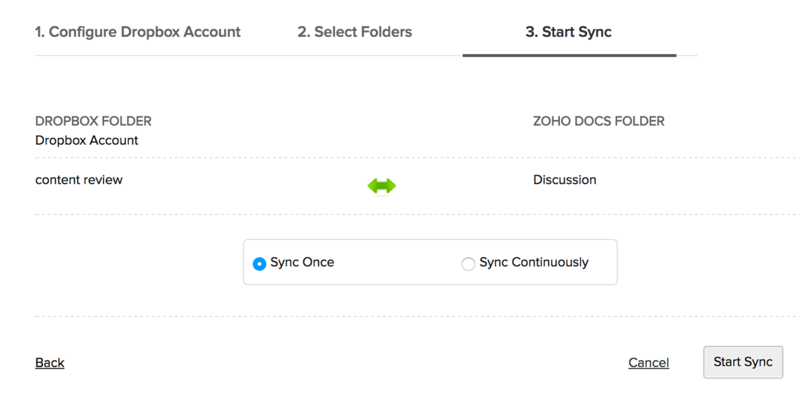 Sync Once - Files are synced from your Dropbox into Zoho Projects and vice versa only once. Sync Continuous- Files are synced from your Dropbox into Zoho Projects and vice versa as and when files are uploaded or updated in Zoho Projects and Dropbox. Sync Once - Single-headed arrow in Green indicates that you've set Sync Once for file updates. Sync Continuous - Double headed arrow in Green indicates that you've set Sync Continuously for file updates. Stop Sync - Blue color button when clicked stops the sync operation for this project. Delete Sync - Red color button when clicked deletes sync operation for this configuration. Select any number of subfolders from your Dropbox and map it to any particular folder in Zoho Projects. Only one-to-one mapping of folders is supported in Zoho. But you can map another from same Dropbox account. Supports mapping of folders between two different languages in Zoho. Latest updates get synced for every one-minute time interval between Zoho Projects and Dropbox and vice versa. File names are unique in Dropbox, so every update of the same file is maintained as next version of Dropbox. File names are not unique in Zoho Projects, so every version of Dropbox file is added as a new file in Zoho. Max file limit per upload is 125MB in Zoho Projects. Max file transfer limit is 125MB for instant upload and 300MB for scheduled upload i,e for Sync Once / Continuously. Sync schedule starts The sync operation has been properly started. Dropbox Fetch Success Your files from DropBox are successfully copied into documents area. Dropbox Push Success Your files from Zoho Projects are successfully copied in Dropbox. Sync stopped The sync operation is successfully completed. Disk Space exceeded Maximum allocated disk space reached for your portal. Folder not found The folder you specified is not present or must have been deleted. Path not found Sorry, the specified folder path is not found. Please provide the correct path. Too many entries Your file size in the folder has crossed the maximum allocated file limit of 10000. Unable to access file Unable to access your file in Zoho Projects. User Over Quota You've crossed your maximum allocated space for this account. File size more than allocated Your file is too large to be uploaded in Zoho Projects. Dropbox not reachable Cannot access the DropBox account specified by you. Please try again. Account already exists The account you are trying to configure has already been configured by another user. You can configure a Dropbox account only once. You can view the Dropbox account configured only by you.